Another cloudy morning. The dreary weather was getting monotonous. Off to the Isola di San Michele and Il Cimitero. The island, which consists only of the Cemetery of San Michele and its church, is located just northeast of Venice. At one time, the dead were carried from the city to the island in black funeral gondolas, decorated with gold-winged angels. 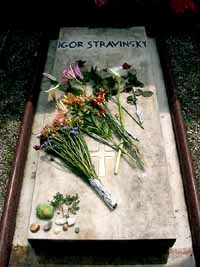 Stravinsky, Diaghilev, and Ezra Pound are buried there. 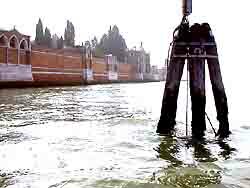 Alas, the cemetery is now full, and Venice must send its dead to the mainland for burial. The American poet, Ezra Pound, was born in Hailey, Idaho, in 1885. 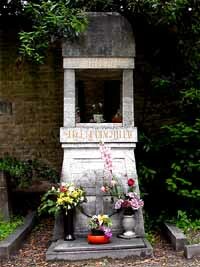 He emigrated to Europe in 1908 and lived in Venice, London, and Paris before settling in Rapallo, Italy, in 1924. An anti-Semite who hated American capitalism, he supported Fascism and Mussolini during the 1930's. From 1941 to 1943, he broadcast Fascist propaganda in English on Rome radio. The Italian partisans arrested him for treason in 1945 and imprisoned him in Pisa before deporting him to the United States for trial. While in Pisa, he allegedly declared that Hitler was a martyr comparable to Joan of Arc. The Americans ruled that Pound was mentally unfit to plead to the charge of treason and incarcerated him in St Elizabeth's Hospital in Washington from 1946 to 1958. Upon his release, Pound returned to Italy. 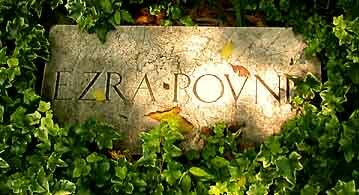 Pound continued to write and publish during his incarcerations in Pisa and Washington and up to his death in Venice in 1972 at the age of 87. Pound was writing of the futility and stupidity of World War I, but similar dark thoughts occur when one contemplates the descent of Venice from a empire of great bankers and merchants to the petty chicanery of today's merchants of Venice. We returned to the city and walked through the Castello district, starting at the Fondamenta Nuove. We passed along the Fondamenta dei Mendicanti, a canal to our right, the civil hospital to our left. Once a guild hall, the Scuola di San Marco was converted into a hospital almost two hundred years ago. Its impressive entrance, on the Campo of Saints John and Paul, is obscured today by scaffolding. Renovations and scaffolds are a common sight in Venice, disappointing to the current tourist but a good sign for the future. Cities built on water centuries ago require lots of maintenance. Campo Santi Giovanni e Paolo is one of the grandest campos in Venice. It was once the site of many civil and church ceremonies and celebrations. In the center is the great equestrian statue of Bartolomeo Colleoni, a famous 15th century military leader. On his death, he bequeathed his great fortune to the Venetian Republic on the condition that an equestrian memorial to himself be built in the Piazza San Marco. 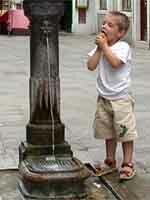 This created a dilemma because any monument in the Piazza San Marco was forbidden by law. The state solved the problem, and thus kept the money, by erecting the statue in front of the Scuola di San Marco. At the opposite end of the campo is the Basilica dei Santi Giovanni e Paolo. Built by the Dominicans in the 13th century, it is one of Venice's great pieces of Gothic architecture. I particularly liked the monuments to many of the doges, which were sculpted by some of Italy's most prominent artists. 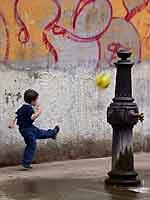 We had a pizza in the campo and enjoyed watching the ragazzi (young boys) kicking their soccer ball around. Lots of energy. We had less energy and meandered through canals and streets for the remainder of the afternoon. For dinner, we headed back to the Trattoria ai Cugnai, looking for another enjoyable meal. Not to be. Instead of the loopy waitress, we were served by a rather stern woman. The service was slow, the food was mediocre and overpriced, and we were overcharged by almost 20%. And it took a lot of arguing before the lady admitted her bill was incorrect. The three grannies weren't as appealing tonight. One of the problems with Venice, which began to irritate us more and more as our stay lengthened, is that everything is extremely expensive. Except for the 7-day vaporetto pass, we found no bargains at all. And this must be the only city in all of Italy with mediocre food. In France and other parts of Italy, you can get a good meal at reasonable prices in almost any restaurant, no matter how small. But we never experienced a single exceptional meal in Venice, even at Antiche Campane, renown for its seafood. Other cities are known for being pricey but at least you can get you money's worth in them. Not so in Venice. 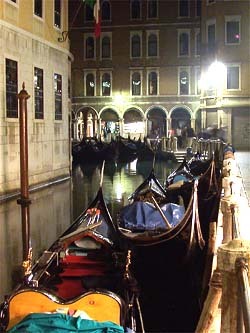 We ended the evening at a canal-side restaurant near the Rialto, relaxing over drinks, and watching the gondoliers put their gondolas to bed for the night.